When looking for methods on how to shrink uterine fibroids naturally, the common recommendation is to add more fruits and vegetables to your diet since research supports the ability of a mainly plant-based diet to reduce or eliminate the risk of developing uterine fibroids and many other diseases and conditions. The daily requirements for fruits and vegetables is five to seven servings per day but this can be challenging for many people which is why green juices and green smoothies are very popular as they can allow you to get your daily servings of fruits and vegetables with just one drink or smoothie. But which is better if you have uterine fibroids or any other disease or condition. While it cannot be said that fruits and vegetables will cure you of uterine fibroids or any other disease, increasing your consumption of various fruits and vegetables is still highly recommended if you are searching for methods on how to shrink uterine fibroids naturally as well as other diseases and conditions because fruits, vegetables, grasses, etc are packed with vitamins and minerals and various other healing compounds from carotenoids and flavonoids that they contain which can help to create a healthy disease free body and reduce your risk of developing various diseases and conditions. These vitamins and minerals and other phytochemicals help to boost your immune system which helps the body fight off harmful disease-causing properties such as toxins and free radicals. If you want tips on how to shrink uterine fibroids naturally, any fibroid healing regimen you adopt should seek to create a balanced hormone environment and vitamins and minerals found in fruits and vegetables can help to create this environment. But like we mentioned above, you will need to eat five to seven servings of fruits and vegetables every day which can be such a chore for many people. 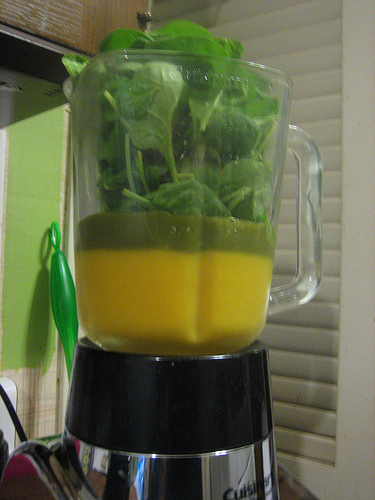 Hence the popularity of juicing or making smoothies to get the required daily amounts of fruits and vegetables. But which is better? Both methods will help you get the vitamins and minerals that you need for cleansing the body, boosting immunity, treating various diseases and conditions, and so on and so forth. While you can certainly use either method, one is much healthier than the other especially if you have uterine fibroids. Which is it? When you juice your fruits and vegetables, the pulp is discarded. This pulp is very important whether you have fibroids or not but especially so if you have fibroids. The pulp contains fiber and additional vitamins, minerals and other phytochemicals that you need. Fiber is very important if you have fibroids because not only does it help to get rid of waste and toxins in a timely manner but it also helps to get rid of excessive estrogen. An estrogen dominant state is commonly blamed for the development of uterine fibroids. Consuming plenty of fiber is one of the ways to get rid of this excessive estrogen. In addition, if you are dealing with certain symptoms of uterine fibroids such as constipation, this extra fiber will be beneficial for defeating constipation and relieving this symptom. Blending as opposed to juicing fruits and vegetables helps ensure that you use all parts of the fruits and vegetables even those that you may not normally eat if you ate the actual fruits and vegetables which means that you will get an extra boost of vitamins, minerals, phytochemicals as well as the fiber from the pulp, skins, pith, etc, of various fruits and vegetables. Making smoothies can also allow you to add other healthy ingredients such as plain yogurt which will give you the probiotics you need, calcium from almond milk, soy, milk, etc. Making smoothies definitely reigns supreme if you are deciding on whether to juice or make smoothies from fruits and vegetables as part of your fibroid healing regimen. When making smoothies, it is better to make it yourself because many of the store bought smoothies contain lots and lots of sugar, ice cream, sweetened yogurt, sweetened fruit juices, etc which defeats the purpose of a healthy green smoothie. A natural fibroid healing regimen is more than adding more fruits and vegetables. For step-by-step guidance on how to shrink uterine fibroids naturally besides making diet changes, you need the Fibroids Miracle guide to not only help you get rid of fibroids but also prevent their return. Find out more about this scientifically proven holistic guide here. Prev Top 5 Amazing Natural Remedies For Ovarian Cysts That Actually Work! Next Top 25 Best Health Affirmations To Help You Finally Eliminate Uterine Fibroids!